I do handstands because they feel good in my body, and they make me smile: there’s nothing serious or useful or terribly goal directed about turning yourself upside and looking at the world that way. It’s silly and fun. Want to to work on your alignment, so you won’t fall on your head? Try this: Place your hands, outer shoulder distance apart and parallel, at roughly lower-rib height on the wall. Walk slowly backward, hinging forward at your hips until you your arms and spine make one long straight line from your wrists to your tailbone, and your hips are directly over your feet. Hug your arms in toward each other, then press your hands and tailbone away from each other. This is the same alignment you will need to hold a handstand. Want to work on your strength, so you won’t fall on your head? Try this: Take a shorter-than-normal downward dog stance. Carefully set your hands parallel and shoulder distance apart. Hug your arms in toward each other and keep them perfectly straight. Step your right foot a little forward, with your knee bent. Keep your left leg straight and engaged. Using your right leg as your push leg, and your left leg as your swing leg, kick your left leg up into the air as many times as you can, for one minute. Be sure to keep your left leg straight and don’t allow it to swing out and open to the side! Now repeat on the second side. Try not to allow your shoulders to come forward as you kick, but keep your spine and arms in one long line. Want to work on your confidence, so you won’t be afraid of falling on your head? Try this: Place two blocks lengthwise side-by-side on the lowest setting along the wall, like a long and low shelf. Set up table pose with your toes touching the blocks and push up to a slightly shortened downward facing dog. Step your feet up onto the blocks. Be sure to keep pushing your hips up and back and drawing your arms together, to keep your shoulders from coming forward over your wrists. If you are comfortable with this slightly more inverted version of the pose, stack two more blocks, again on the shortest height, on top of the first set, and try the pose again. Repeat until you’re feeling confident. Try these tips in your home practice, or outside in the grass with friends! 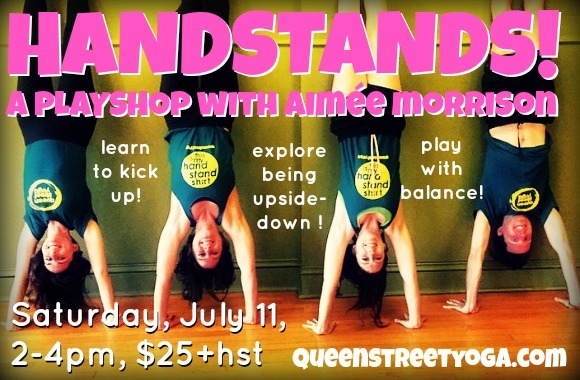 If you would like to get more in-person tips on handstand, join me on Saturday July 11 for a two hour playshop all about the mighty handstand. Is this workshop for you? Probably! If you’ve been practicing for at least two months and can do a downward facing dog? And you don’t have major wrist injuries? Yes! Does the idea of doing a handstand make you nervouscited? (That’s “nervous” and “excited” at the same time). Great! We can work with that! Do you kick up with ease but not a lot of control? Or do you get alllllllmost all the way there? Or do you feel wobbly and unsure once you’re upside down? Ultimately the key feature of a handstand is that you’re upside down. So the workshop will focus on how to have the proper alignment to support being upside down, the strength to support staying upside down, and the emotional confidence to trust ourselves to get upside down in the first place. Expect some detail on how to align the hands and arms to be safely weight bearing, and how to align the pelvis to find length and stability in the pose. We’ll work on engaging core muscles to help with balance and alignment, as well as across the upper back and in the legs to hold the pose safely and with ease. We’ll go through a variety of variations to handstand, beginning from from downward dog with feet up on blocks, through to kicking up away from the wall, depending on your level of comfort and skill. 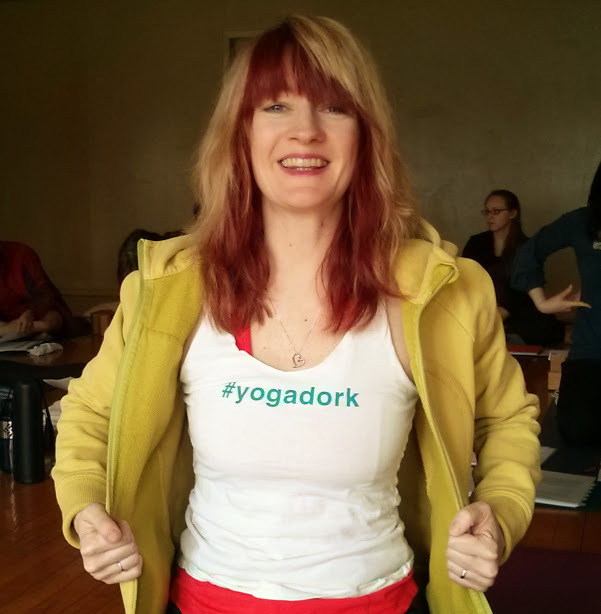 Aimee Morrison is a graduate of our 2014 Yoga Teacher Training Program. When she’s not at the studio, she is teaching Critical Media Studies at the University of Waterloo, having fun with her daughter, or taking selfies on her phone after runs in the rain.